Point Style/Ink Color : Medium Point Ballpoint: Black and Red Ink, .5mm Lead Pencil. Barrel Color : Choose from selection shown. 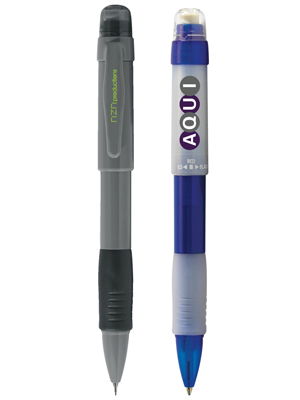 Translucent Green and Blue pens include frosted clear cap and grip. Solid Gray pen includes a black grip. Switches from a red ballpoint pen to a black ballpoint pen to a .5mm mechanical pencil with a simple twist. Imprint Area: 1 1/8" x 5/16"
Imprint Area: 1" x 7/64"
Packaging: Standard - 4 lbs. (approx.) @ 100 per carton. Special packaging (click here). ground rates. Click here for more information.